Built tough, this compact, sealed 5 amp gel cell delivers portable power anywhere! 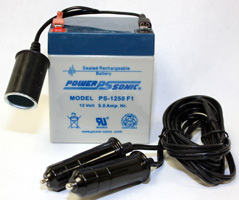 Use it to power your optional Hot Tap 12v pump without the dependancy of a vehicle's battery. Also great for powering cell phones, laptops, fish finders, lights etc. Sealed design allows use in any position - will not leak! Simply plug recharging cable into your vehicle's cigarette lighter to recharge.